She learned cuss words. She learned attitudes. She learned meanness. She learned insults. She learned that when you spell S-E-X you should whisper. She learned far more than a five-year-old needed to know. I watched her playing with her friends this weekend, a full two-years after I started committing her friendships to prayer. And, oh, I about cried at her birthday party. Not because my baby is nine-years-old (although that might be another breakdown in the making)…..
Because God so graciously answered my prayers for my daughter. She had gathered around her the nicest group of quirky, funny, playful, kind, encouraging, creative, sweet, and thoughtful girls, and each one of them is a reminder that God hears our prayers for our children. We don’t have to get wrapped up in programs, extras, Pinterest-activities, decorations, household management strategies, and developmental milestones. We don’t have to compare ourselves to any other mom or our kids to any other kids. I really needed this today!!!! Thank you!! I’m so thankful for how God does that—brings us just the word we need at just the right moment! Thanks for sharing! This post has really stirred up my heart today. You are so right when you say we should focus on praying for our children. Even when we don’t see results. That is where I have lived for many years in regards to my son. I too prayed for godly friends for him and that he would make wise choices. But that’s not what happened. Yet I continue to pray. To trust God with writing my son’s story. Nothing brings you to your knees more fiercely than watching your child go down a path opposite of what you long for in your heart. Lisa, your comment really presses that point home, that prayer isn’t an easy fix and God doesn’t always answer right away or according to our timing or plan. But your son is so blessed that his mom prays for him, even if he doesn’t fully appreciate that in the moment. 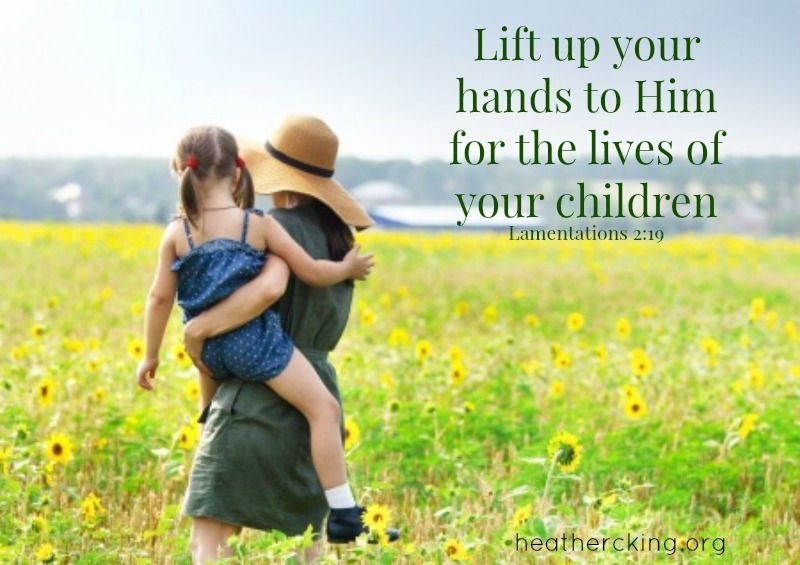 My kids are still so young, but I’ve heard of this book before and it might be worth checking out, “Praying for Your Adult Children” by Stormie Omartian. Blessings!